The Monolith Festival: I was intrigued by the lineup for multiple reasons – this was certainly the most ‘indie’ looking festival I’d seen in awhile – more in tune with Pitchfork than Lollapalooza. The headliners went from Devotchka, Silversun Pickups and Atmosphere to Justice, TV on the Radio and CSS. Those names alone tell you something different is going on and the litany of bands on the underbilling reinforced that idea. 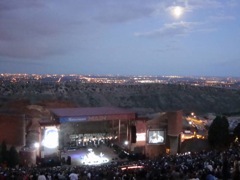 But first a bit about our host – Red Rocks Amphitheater is, seriously, the most beautiful outdoor concert area I’ve ever seen. Situated in the town of Morrison, just outside of Denver, it’s a model in development that works with the environment rather than bending it to development’s will. Denver is, however, 5,280 feet above sea level and this raises problems when it comes to, you know, breathing. Less oxygen makes a good stair climb, of which there are many at Red Rocks (approximately 230 steps from the bottom of the amphitheater to the top), a much more tiring task. Both days at Monolith proposed similar problems – namely too many good bands jammed together. Especially during the early part of day one. Luckily, the festival crowd didn’t pick up until nearly 4 o’clock. This left plenty of room to move to catch bands up close. With five stages to choose from, there was a lot of cycling in style and space. Austin, Texas’ Erin Ivey opened the day with a beautiful, low-key performance on the acoustic stage, a great place to catch some quieter, more subtle performances throughout the day. Rock Plaza Central would also give a good show on this stage later in the afternoon, sampling new songs from their forthcoming new album and from last year’s Are We Not Horses? The Port O’Brien set was a good example of everything that was good about Monolith. The crowd was a feel-good crowd, eager to dance and sing along, eager to enjoy every band that could be enjoyed and it made circulating and talking with people an absolute must. This festival, for one reason or another, was drawing in people really, seriously passionate about the music on stage. This wasn’t a festival where people came in simply to roam around, get drunk and think about listening to the music after the fact. Which did lead to the first, and not last, frustrating moment of the weekend. Sequestered within the rock of the amphitheater are two smaller stages that were used, taking turns back and forth, to showcase some of the smaller bands. These were rooms with limited capacities that probably topped out at about 200-250 people at the most, though I’m often bad at estimating those things. Enter Blitzen Trapper. With a fantastic new album hitting shelves soon and certainly a fast rising star, they were sure to have a crowd. I was about five minutes late for the start of their set and found myself stuck outside of the room with no way to get in. Packed, person to person, all the way out the door, there was nothing I could do but stand back and hear some of the music coming out the door. Blitzen Trapper had been on my top list of bands to see and I was thwarted. This wasn’t the last time this would happen as day two would attest soon enough. red rocks is amazing. absolutely amazing. if you are a live music fan, you MUST see a concert there. even if its not someone you are terribly interested in, just GO. Thanks for the post. I have seen more shows at Red Rocks than you can shake a stick at and I never tire of the place. Night shows are particularly amazing. You are dead on with the way in blends into the landscape. There is a hallway that leads from the green room (of sorts) to the stage with all manner of signatures on the walls of bands that have graced the Red Rocks stage. Among the scratching are the signatures of all four members of the Beatles. Years ago a buddy of mine knew a big wig there and tried to get us access. Alas, it didn’t happen, but I still hold out hope. As a side note, for many years, every show presented yet another search and rescue effort for kids that decided to climb the sandstone that surrounds the venue. I can imagine something similar going on when you were there? They played on Day Two, aburtch. Pictures and writeup coming shortly.